When we asked young mother Claire Hamilton to try cycling to work for a month for Cycle Lifestyle issue 2 she thought we were having a laugh. No way! She had a baby to look after, and felt too tired and unfit. But she ended being the one who was laughing; feeling healthier, fitter and above all more independent, she was soon a regular cyclist and a more energetic mum. I have been putting off cycling to work for years. I got a job on the opposite side of London, and told myself it was too far for a beginner cyclist to get to. I even went travelling in Australia and New Zealand. And, when I got back, I took a job in Northampton, so commuting by bike from London was definitely out of the question. Then I got pregnant – so that was the end of the matter. No more discussion, guilt, or what ifs. I would never be one of those people who come into work slightly bedraggled and wet and wearing luminous clothing and trousers tucked into their socks. Not me. I was a car girl. Done deal. Then, inexplicably, strange things started to happen – a succession of events and thoughts that propelled me towards my inevitable, groundbreaking first cycle to work. I had my baby… I got a job ten minutes away from home by car… On my first day I discovered that there was a secure bike shed at the back of the office… My friend asked if she could store her new mountain bike in my garage, and said I was welcome to use it anytime… I needed to get fit and I had no spare time to exercise, especially with a small baby to look after, so getting a burst of fitness in on my way to work suddenly seemed very appealing… And when the January and February snow finally stopped (sort of), the sun came out (sort of). I had run out of excuses. Gareth Jenkins made it sound easy in his “Give it a Go” article in the first issue of Cycle Lifestyle, and I thought if he can do it, I jolly well can. So on a bitterly cold day in early March, I found myself getting my bike out of the garage and donning a cycle helmet I had discovered in my mum’s loft and a mud-spattered luminous vest which definitely looked past its sell-by date. I was ready to cycle to work for the very first time. When I say ‘ready’, with hindsight I was anything but ready! After months of storage in my shed, there was no air in the bike tyres and I didn’t know how to get the pump to work. Fortunately a kindly local builder was passing and managed to get the tyres inflated for me just as I was getting ready to wheel the bike back into the garage for another year. I then had to lower the seat, and was soon trying in vain to fix my work bag to the bike with a piece of string that was in the garage. Yep, I’m no expert. I hadn’t factored in any extra time for all this unplanned fixing and preparation, so I was now running severely late for work. This would have been ok if I had not lectured my team the day before on the importance of punctuality. I could already see the raised eyebrows as I walked past their bank of desks. Then it started to snow… heavily… until a blanket of snow was forming under my inappropriately clad feet. By now it was so late that I had to just get on my bike and go for it. Cycling to work had become a battle of wills, with me pitted against the elements (and against the lump of metal I was trying to climb on top of in my skirt and heels). I pushed the bike through the snow-covered drive, lifted myself up and pushed myself off, down the steep hill which led to the park. I was off! As I was hurtling down the hill, I had a last minute thought that I should test the brakes. Fortunately they worked and I breezed through the park and onto my first proper road. So far so good. Five minutes into my ride my hands were numb with cold (should have worn gloves), my bum hurt (should have… er…?) and I discovered my helmet was too big and kept slipping over my eyes every time I turned my head. But believe it or not, after a few wrong turns and countless adjustments of my helmet and work bag, I arrived at the office. I was soaked through, with wobbly legs and totally bedraggled, but boy was I exhilarated! The four mile journey only took twenty minutes and I had managed to cycle up every hill without getting off the bike and pushing it – what a result! I was so proud of myself. I had managed to find back-routes to work, negotiate the rush hour traffic, and remain in one piece. I had conquered the bike and was ready for anything. Anything, that is, except the sun setting and darkness falling by 5.30 pm when it was time to cycle home. I had forgotten to put the ruddy lights on the bike! Following a desperate call to my other half, he bundled the baby into the car and came to pick me and the bike up. He then helped me compile a list of the things I needed to do to ensure that the cycle to work would run more smoothly. I booked the bike into a local bike shop to get it serviced, I bought some casual sensible gear to wear on my bike ride, I bought a ‘pannier’ (a special bag that clips onto a rack on the back of the bike) and a new helmet – and, oh, I nearly forgot, I got a padded bike seat fitted! After a week of proper preparation, I was back on my bike. I only work three days a week so now have a routine where I cycle to work every Tuesday. It’s not every day, but it’s a start and much better than a few months ago. I drop my daughter Rosa at nursery and then drive to my parents’ house where my bike is stored. I then cycle to and from work and collect Rosa at the end of the day. It’s a bit more effort than jumping into the car, but it’s far outweighed by the benefits. The biggest change for me has been how much healthier and livelier I now feel. Before I started cycling to work, I did no exercise at all. I was desperate to lose some baby weight and I felt unfit and sluggish – a far cry from my pre-baby self. With a demanding ten-month-old and a challenging part-time job, I just didn’t have the time or energy to get fit, even though I knew deep down it would make me feel so much better. So cycling has been perfect for me. I now know that once a week I am going to get 40 minutes of exercise on my way to and from work. I definitely feel fitter and it’s amazing how the weight is falling off again after I had hit a brick wall. I get into work feeling bright and ready for the day, invigorated and alert, and I drink far more water than I used to. I have also found things in common with other people in the office who cycle to work. You just can’t tell from looking at someone – they all look pretty normal to me! And I love the time I spend riding to work. It is a rare moment just for me, when I feel independent and free. Like Gareth, I love cycling through a London morning and being exposed to the fresh air and the weather, and I notice far more than I used to on my journey to work. So I would wholeheartedly recommend to anyone who lives within a reasonable distance from work to try to cycle there. If things are busy and tough with a family, don’t set yourself up to fail but set an achievable goal. For me, cycling once a week is the right goal as I can do it without too much effort – which is the order of the day with a little one and a part-time job. I am even considering buying a baby carrier for some weekend casual cycling in the park with Rosa. My main advice would be to get organised before you start. I was so keen to get going, and had been putting off my cycle ride for so long, I just jumped on my bike. With hindsight, if I had been more prepared for my first ride it would have gone much more smoothly. Make sure your bike is working, the lights are fitted, your seat is the right height and you’re appropriately dressed (in clothes that are neither too baggy nor tight, and flat shoes). You don’t need to buy flashy kit, but it’s worth buying or borrowing some specialist gear – like a reflective garment and a pannier bag. And when you plan your route, make sure you allow ample extra time for your first run! There you have it. I am a busy mum with precious little time for me, so if I can do it, so can you! Go on and give it a go... and let me know how you get on. Cycle Lifestyle issue 10 – it’s here, there and everywhere! The new issue of Cycle Lifestyle is now available online and in 10,000 paper copies delivered to a record number of locations throughout London and beyond. Over 600 organisations, workplaces and public buildings will receive our magazine this time round. Cycle Lifestyle is completely free and aims to inspire not just regular cyclists but regular people. As well as championing the many benefits of cycling, issue 10 contains advice on getting started, staying safe, planning a route and winter cycling, columns such as the Peddler, New Bike on the Block and Grin up North, and uplifting features such as Give it a Go, cycle poetry and a bike-themed short story. There’s also a fantastic London Cycle Map Campaign poster in the centrefold. If you want help to promote cycling within your organisation or elsewhere, then feel free to use the embed codes for the magazine on your website (see below). If you would like to find out more, visit www.cyclelifestyle.co.uk and please support us by joining us on facebook and twitter. Keep warm this winter – keep cycling. Read more about Cycle Lifestyle issue 10 – it’s here, there and everywhere! Why aren’t the authorities and the LCC telling people to stop cycling on Bow Roundabout? In four years of running Cycle Lifestyle magazine I have resisted the urge to comment whenever a cyclist is killed in the capital. I find it crass that newspapers and campaign groups all converge on the news, like in one of those feeding frenzies shown on David Attenborough's Blue Planet. Nothing attracts a crowd like a crowd. And nothing attracts a crowd like ill-thought out, rhetorical nonsense. Cycle Superhighways are ill-thought, rhetorical nonsense dressed up as policy. Most people, including most cyclists, are wary of cycling on main roads. So TfL pandered to the fears of everyone by daubing blue paint along a handful of the capital’s biggest, most salient main roads. Never mind whether those roads, with lorries and buses and cars hurtling along them, were actually made safe by the blue lines, or whether there were alternative cycle routes that could have been made more accessible. Keep it simple and sensational and the media will gather round. So too, it seems, will the cycle campaigners. The London Cycling Campaign is, in effect, calling for the continuation and expansion of the Cycle Superhighways policy (no surprises there: the LCC is partly funded by the government) by imposing cycle facilities, albeit better ones, onto more main roads and major junctions in London. Never mind whether this dream is remotely feasible in practice. Never mind how the economy is supposed to function when the capital’s motor arteries have been attenuated by cycling infrastructure. Why aren’t the authorities and the LCC telling cyclists to stop cycling on Bow Roundabout (at least until suitable infrastructure improvements are made, assuming they can be made at such a complex traffic interchange)? Is it because neither the government nor the campaigners can admit that their ideas have been wrong? Is it because the greater the ongoing ‘conflict’ between motorists and cyclists in the capital, the more government officials and cycle campaigners need our money to fix things? I’ve never been to Bow, but when I’m cycling I take the backstreets so as to avoid massive, potentially dangerous roads and roundabouts. If I can’t avoid them, I dismount and use the pavement. I want to help all cyclists avoid the worst areas for cycling in London. So Cycle Lifestyle is calling for a Tube-style ‘London Cycle Map’ showing a network of signed cycle routes on quieter streets or on main roads and major junctions that have already been provisioned properly for cyclists, enabling cyclists to get safely from anywhere to anywhere in the capital by following a few trails of colour. The whole project would cost a fraction of the Superhighways scheme, but that doesn't mean that future cycle developments on main roads should never been an option, simply that the priority for these developments, where they are possible at all, should be making the routes on the network more direct. A London Cycle Map doesn’t sound simple or sensational. But its results would be. Read more about Why aren’t the authorities and the LCC telling people to stop cycling on Bow Roundabout? The BBC has reported that TfL is advising Tube users not to use the Northern Line between Tooting Bec and Clapham North from 8am to 8.45am. Apparently commuters are having to wait two or three trains before getting on, due to congestion. People could try walking or cycling instead, Tfl has advised. Does it strike anyone else as strange that people should need government advice on something as straightforward as taking a healthy, uplifting short walk or cycle ride each day rather than sitting on a Tube train which, even in the best of times, labours through a stuffy, claustrophobic tunnel and is rammed with stressed-out commuters? I consider conditions on the London Underground to be a humanitarian issue which is awaiting its time for public attention and action. But if the Tube, at least in its current form, is a grim relic that deserves to be consigned to history, then why do people persist in using it, when they could be cruising through the streets on a bicycle or e-bike? Are Londoners masochists? I’ve got a few theories. I think the difficulty of navigating by bike in the capital makes people scared that they’ll stray onto main roads and into heavy traffic when cycling. A Tube-style London Cycle Map showing a network of safer, quieter signed backstreet routes would instantly solve this problem, and get people off the Tube and onto their bikes. Yet regular Londoners aren’t exactly clamouring for a London Cycle Map. They seem resigned to their underground fate. What’s going on? Psychologists have identified a simple mechanism whereby a person can become trapped in a dysfunctional relationship. Any relationship that causes stress and uncertainty, and inconsistently gives support, can dampen a person’s confidence so much that they don’t even have the confidence to make a change. I often think of this when I see ashen-faced commuters scanning disrupted train timetables so anxiously that they are unable to contemplate an alternative way of travelling. If TfL really wanted to wean people off disempowering trains and onto liberating bicycles, they could inform commuters every day, not just at exceptional times, of the benefits of cycling. They could, for instance, supply copies of Cycle Lifestyle at every Tube station. We asked TfL to do this, and they declined. I guess there’s more money to made from the freesheets that are supplied on the Tube – freesheets that are full of bad news (often, indeed, about cycling) and mind-destroying celebrity nonsense all of which further dampens people’s impetus for positive change. Judging by the amount that British people moan about it, you’d think rain was some sort of chronic misfortune inflicted upon the country by malevolent cosmic forces, rather than an inevitable part of the ecosystem in a green and pleasant land. And as for cycling in the rain, this strikes most people as unmentionably ludicrous. The other day when I told someone I had arrived by bicycle in the rain, they looked at me like I was some sort of weather masochist. Fair enough, getting wet and cold isn’t everyone’s cup of tea. But it doesn’t take a rocket scientist to work out that you don’t have to get wet and cold while cycling. Just as the lowly umbrella saves Britain’s walkers from wetbumageddon, a humble pair of overtrousers completely nullifies wet weather. To state the bleedin’ unobvious, if you want to stay dry while cycling, you just stick overtrousers on over your trousers, put a raincoat on, get on a bike and ride. I bought my overtrousers for £20. They’re ‘breathable’ – which basically means I don’t get too hot while I’m wearing them – and they slip easily over my shoes. 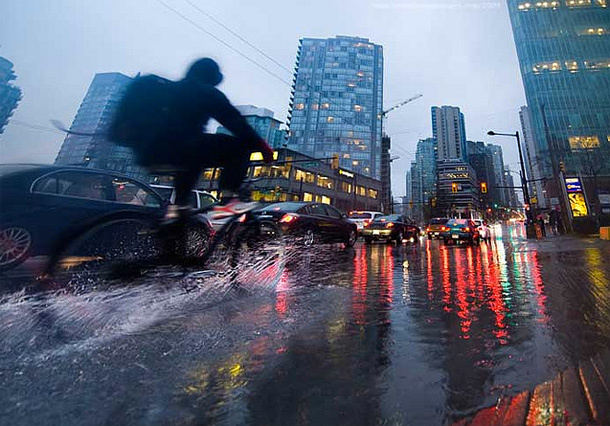 So while other people are scurrying along the footpath peering under the rim of a dripping umbrella, or sitting in a massive traffic jam staring at their car’s windscreen wipers, I get to enjoy the beauty of cycling in the rain: the brooding sky, shop windows like stained glass, and black rivers flowing down the street. Cold winds and flapping tracksuit bottoms meant I recently bought my first pair of black cycling leggings. Now I am not one to dive in without researching a product first, so I can report that Men’s Fitness magazine says that black leggings improve aerodynamics and keep the heat in… which is all well and good, but what everyone wants to know is: will they look good? I am one of those people who for some reason find it extremely embarrassing to try things on in a shop before I buy them, especially things that could potentially leave people in the changing rooms sniggering behind their curtain as you “model” your new purchase. I once thought I could pull off a Trilby Hat and a lady almost passed out from laughing so hard. So trying on skin-tight Lycra was just not a consideration. Instead I decided I’d have to just ask the guy in the shop about leggings (a personal first for me). He advised that if you have a bit of a belly you should buy the ones that strap over your shoulders like a leotard. His words, not mine... “like a leotard”, he said. I shuddered and asked for the “Not in any way like a leotard ones” and he passed them over. I noted that even they had elastic bits that strap under the feet like the trousers my little sister wore in the ’80s. I sighed heavily and shook my head as I handed over the cash. The first test was a cold, brisk day and I slid my new leggings over my shivering legs. Then, with all the masculinity I could muster, I fed my tippy-toes through the elastic foot straps and wondered whether Robin Hood felt as stupid as I did wearing tights. It also struck me that the cold weather could potentially bring another small issue to the fore. These leggings should come with a glass case with a rolled up sock inside it saying “In case of Shrinkage, Break Glass, then Stuff”. As I hit the trail to work, I sliced through the air like an arrow and felt out in the elements yet snug and warm. I have to admit I enjoyed wearing my leggings and I started to wonder whether me taking up cycling had unexpectedly lead to some personal issues I’ve never before considered. By half an hour in, I was feeling like a Tour de France pro as I stood up to pedal and sprint forward when a red light turned to green. But my exhilaration quickly turned to confusion as I felt a draft from the stern. My previously insulated behind had given way to a huge Dagenham Smile. Imagine the scene if you will. You’re on a packed bus in Leyton. Its 7:30am. You’re tired and miserable cos it’s Monday. The bus is quiet and hot. You haven’t even been able to pick up a newspaper this morning. Suddenly the silence and monotony is broken by a teenager banging on the window and laughing with his mate. As the bus slowly overtakes it rolls past the wobbly figure of a 31 year-old man wearing thick gloves and trying to wrestle his leggings back up. “His bum’s hanging out! OI MATE, YOUR BUM’S HANGING OUT!! HA HA HA!” The forlorn figure gestures and waves pathetically to hide his humiliation as the bus passes him. In a nutshell, I hadn’t given enough thought to the leotard. Another thing I hadn’t given enough thought to is the fact that a bus travelling at an average speed of 30mph whilst stopping sporadically at Bus Stops on the Lea Bridge Road can overtake a cyclist travelling at about 12mph around five times, thus ensuring that the cyclist can be reminded that his arse fell out of his trousers by teenagers on a further four occasions. I doubt anyone has done a parachute up as tight as I tightened the waist chord of my leggings for the trip back. But to wear a leotard? A unitard? Jeggings? A mankini? Leggings are enough of a guilty pleasure for me, and I strongly recommend them. Well – for the time being at least. Coming soon to a store near you… “Gentleman’s Cycling Braces”. They come with a pipe, a monocle and a maintained sense of dignity. I saw the signs: the National Cycle Network and its lessons for London. To borrow a saying of Bill Bryson’s: if you’ve never ridden on the National Cycle Network, do it now. Take my bike. It’s wonderful. The National Cycle Network is a set of connected cycle routes, either off-road or on quiet roads, providing extensive coverage of Britain via some of our island’s most stunning scenery. Expertly conceived by Sustainable Transport charity Sustrans, the network is equipped with signs showing cyclists how to follow the routes. The signs take all the hassle out of navigating. Rather than planning and noting down numerous turn-rights and turn-lefts before you go, you can just remember a few route numbers and follow the signs. Recently, I met with Daniel James Paterson, a volunteer ‘Sustrans Ranger’. Daniel rides out every couple of weeks on a stretch of National Cycle Network near Cambridge, to check that the route is functioning properly – that the road surface isn’t damaged and there are no other obstacles blocking the route, and that the signs are in good repair and visible, e.g. not obscured by overgrown bushes. I joined Daniel on his rounds, so I could get a flavour of the work he does. We covered 50 miles. I was impressed and warmed by Daniel’s conscientiousness. When we encountered a junction at which it wasn’t entirely clear how to follow the route, Daniel spent 20 minutes riding up and down the road, to establish the best position to put up a new sign where it would be most visible and helpful. Most signs on the network are simply stickers affixed to lampposts or other roadside furniture, so almost the entire network, in all its vastness, has been created and maintained efficiently, unobtrusively and cheaply by people like Daniel. There is a helpful online map of the routes which backs up the work being done on the streets. I am particularly fascinated by the National Cycle Network, and its dedicated Rangers, because I think this system shows how easily a similar London Cycle Network could be fashioned. The raw material already exists in the capital. Over the last 30-odd years, around 2000 kilometres of generally safe and quiet London Cycle Network were created by previous governments. The problem is, the network is woefully signed and mapped. In map form, the network is an incomprehensible squiggle; on the streets, the signs are correspondingly incomprehensible or non-existent. Simon Parker has come up with a magnificent plan for making the London Cycle Network easier to understand and use. His Tube-style ‘London Cycle Map’ re-imagines the network as a series of long, straight, parallel coloured routes, transecting the capital in all directions. Using Parker’s map, you could get from anywhere to anywhere in the capital, by remembering just a few of these coloured routes and where to change from one to the other – just like catching the Tube. Well, you could if there were signs on the streets. With a few London Cycle Network Rangers and a few stickers, the network could be up and running within a matter of days. 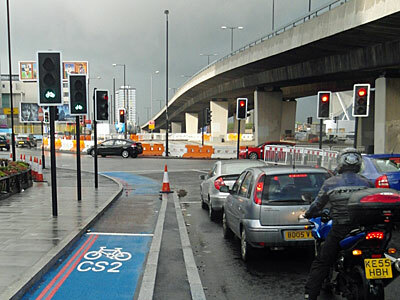 Sure, many of the streets and junctions on the London Cycle Network currently only have rudimentary cycling infrastructure – and road-markings, not just signs, would be useful too – but even a minimally functioning network on mostly safer streets would be better than the status quo. Faced with the task of navigating in a bewildering metropolis, many Londoners currently end up cycling on the busiest main roads. Or, worse, the thought of those main roads puts people off cycling altogether. This universal focus on main roads is reflected in well-meaning but utterly unrealistic calls for the capital’s main roads, as a rule, to be redesigned for cyclists, and in the government’s expensive but not exactly reassuring Cycle Superhighways which consist of trails of blue paint daubed along major motor transport arteries. Earlier this year, Sustrans launched its very promising ‘Connect London’ campaign, calling for a capital-wide network of quiet cycle routes (albeit curiously downplaying the existing London Cycle Network). The sincerity of the campaign cannot be doubted given Sustrans’ previous accomplishments with the wonderful National Cycle Network. But Connect London seemingly lacked detail from the start. In particular, no plan was specified as to how the routes on a usable network of cycle routes in the capital would be organised (e.g. numbered? coloured? named?) and signed. Since then, an online map has been compiled; but in its current state this proposed map doesn't seem to be much of an improvement on the old London Cycle Network squiggle. I’ve no doubt Sustrans are making further plans and that practical results will follow soon. If you’re reading this, Sustrans, I urge you to adopt Simon Parker’s brilliant London Cycle Map as the blueprint for mapping and signing a completed London Cycle Network. And do keep up the good work. 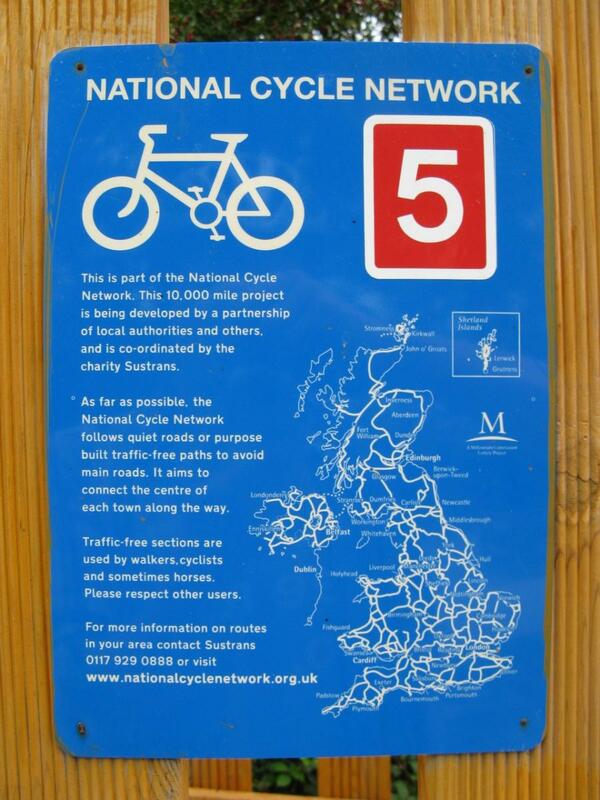 Read more about I saw the signs: the National Cycle Network and its lessons for London. Let’s face it, cyclists sometimes take themselves a bit too seriously. The knowledge that you’re making a choice that’s good for the community can often spill over into righteousness. Perhaps we need to remind ourselves that ‘the power of example is that it is exemplary, not declarative, much less declamatory’, as the genius Theodore Dalrymple put it. The other day I was riding my bike down a narrow, twisting, mountain road. A driver approaching very slowly up the hill started beeping his horn and yelling at me. “PIG! PIG! !” he shouted, “PIG! PIG! !” Naturally, I shouted back something unrepeatable. Then I turned the corner and promptly collided with a pig. A pedestrian stepped off the curb and into the road without looking and promptly got knocked flat by a passing cyclist. “You were really lucky there,” said the cyclist. “What on earth are you talking about! That really hurt!” said the pedestrian, rubbing his head. “Well, usually I drive a bus,” the cyclist replied. I wonder how many adults revisit cycling but give up after only one attempt because they went out on a substandard bike. 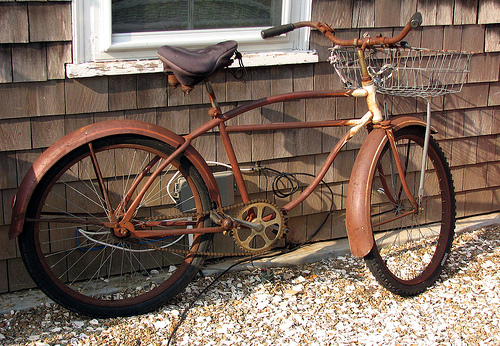 Perhaps they pumped up the tyres and tightened the brakes on an old clunker in the shed, then, after the ride, felt as knackered as the bike. I don’t want to sound like a member of the Lycra brigade, but a decent bicycle really is a must if you want to get the most out of taking up cycling again. You’re bound to feel tired after that first go, but with a good bicycle your fitness will rapidly improve to the point when you’re full of energy each time you ride. On a poor quality-bike (“a bicycle-shaped object”, as a shop assistant once dryly put it to me) you’ll feel like you’re treading water, or running uphill, every time. That doesn’t mean you need to spend a lot of money. You might be surprised to hear that I’ve never spent more than £300 on a bike (being the editor of Cycle Lifestyle is not the most remunerative job in the world). I bought a new bike a few years ago but it got nicked, so I decided, from then on, I would economise by buying secondhand bikes instead. The first I bought (for £100) was sadly inferior to my previous bike, to the point when it took me much longer to get anywhere, and some of my enjoyment was sucked out of cycling. I assumed this was just the way it goes when you buy a used bike, but out of curiosity, I tried out another secondhand bike for the same price. The difference was unbelievable, like riding with the wind behind me rather than in front. Same price, totally different experience. It makes me sad to think of all the newbie cyclists who would have given up, disillusioned, after riding that first used bike I bought. So how are you supposed to know if a secondhand bike is decent or not? Try out a few, so you can compare them. Even better, ask an experienced cycling friend to come along to the shop with you. If they’re like any of the cyclists I know, they’ll be delighted to help. 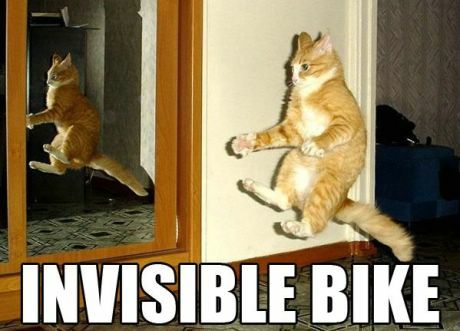 Get the right bike and you’ll feel like you’re flying. Well, I’ve noticed it, and it is especially noticeable when cycling. People seem to be in their own little worlds. Drivers have this glazed look in their eyes. Pedestrians have a thousand yard stare. Even other cyclists often seem to have blinkers on. Perhaps there are some practical explanations for all this. Technology has a lot to answer for. Pedestrians and cyclists – and even drivers – are often texting or making a phone call as they go. Or they’re wearing earphones, which in my opinion is especially stupid when cycling. But I wonder if there is another, more subtle, factor involved. People don’t seem to value awareness anymore. Rather than open themselves up to the world, they want to shut themselves away. Maybe 24 hour (bad) news has made people anxious, and they want to forget about reality. Maybe, for the same reason, people don’t trust each other anymore, and so they want to forget they are part of a community. I find it especially sad when I stop for someone at a zebra crossing, or let someone go first, and they don’t say ‘thank you’. It’s as though they have forgotten that there could be such a thing as a benevolent gesture from another person. Or maybe they’ve just got no manners themselves. Or maybe they think they’re in one big video game, or in a film where they’re the star, with the soundtrack blaring in their ears. Technology probably changes people's attitudes, too. Whatever the explanation, obliviousness is all around. Look out for it – not least because if other road users aren’t being careful enough, you need to be even more alert when cycling.